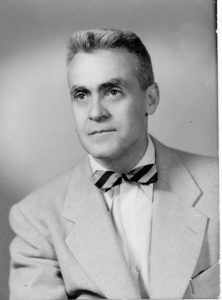 Robert O. Ballou (1892-1977) achieved distinction in American literature as one of the sharpest editors in twentieth century New York publishing, accepting, among other accomplishments, the manuscript for John Steinbeck’s The Pastures of Heaven (1932). 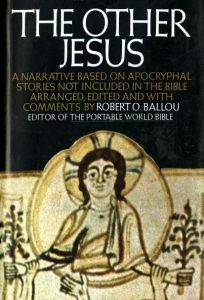 Associated primarily with the Viking Press, his deeply ecumenical interests are reflected in the titles of the books he edited: The Portable World Bible (including selections from sacred volumes), The Nature of Religion, The Bible of the World and The Other Jesus: A Narrative Based on Apocryphal Stories Not Included in the Bible. 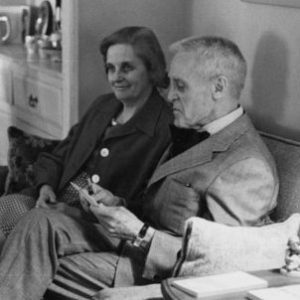 In 1938 he wrote This I Believe: A Letter to My Son, relating his personal faith. After a few years the little wooden church seemed not good enough for us Methodists of Wheaton. Then a very rich man named Elbert H. Gary, a man who was the head of a big steel company which took the iron ore…and made it into rails and locomotive wheels so that people could have “locomotion and transportation” gave us enough money to build a new church building of stone and cement and oak with stained glass for the windows. They called it the Gary Memorial Methodist Episcopal Church, so that it would always bear the name of the man who had given money with which to build it. The way they named it made it sound as though Elbert H. Gary’s name was really more important than the name of Christ, whose church they said it was. And of course it was quite true that Christ had given us no money with which to build a stone church, and Elbert H. Gary had. I remember a man named Blanchard, who was president of Wheaton College. He felt that it was wrong to work on Sunday. He thought the railroads should not run on Sunday because that made the engineers and the firemen and the conductors and brakemen work. And so he would never ride a train on Sunday. Once he had to come visit some friends of ours named Steck, who lived about fifteen miles from Wheaton. He went there on Saturday, on the railroad. But he stayed all night and had to be back at Wheaton on Sunday. But on Sunday he wouldn’t ride on the railroad because he thought that making the railroad men work was not keeping the Sabbath day holy. So he asked Auntie Steck to drive him back to Wheaton and she did. I remember that it seemed to me that making Auntie Steck hitch up the horse (which was work) and making the horse run fifteen miles to Wheaton and fifteen miles back (which was work for the horse), was making the Sabbath day even less holy that it would have been if he had ridden on the train, for the railroad men were working whether he rode the train or not. Seek your God quickly, my dear son. Never cease in your search — you, and all of your generation and those who are to come after you. Let you find quickly the glory of God which will lighten the world before it is too late, lest the spirit of man perish and the human race, proved futile, shall be wiped from the face of the earth by the God of Moses and Elijah, the God of Gautama Buddha, the God of Zoroaster, the God of Vardhamana, the God of Lao-tze, the God of Jesus, the God of St. Francis, the God of your grandmother, the God of Richard Wagner and Beethoven…the God of gentle spring rains, of growing flowers and singing birds, the God of flood and drought and earthquake…the God of peace and of war, of harmony and of discord, the one true God who is within your soul. My love for you and my faith in you be with you always in your search.